Violin Concerto in E minor, Op. 7 (1913) [37:03]. Concert Overture in A minor, Op. 4 (1910) [13:18]. What heart-warming music! Atterberg knew the alchemy for melding his native folk music with the language of romantic-impressionism. Of course he was not alone in this but his life-affirming music remains insufficiently recognised. A V�rmland Rhapsody at first radiates a sense of sun-warmed dawns, flecked with glinting silver-points of sound. Precise and fragile folk material dances in woodland clearings. At the midway point these dances are presented with an exuberant muscularity. Even when the dancing rises to climactic prominence it is counterpointed with yearning romantic ideas. The Rhapsody was commissioned by Swedish Radio for the 75th birthday of the Nobel prize-winning author Selma Lagerl�f (1858-1940). 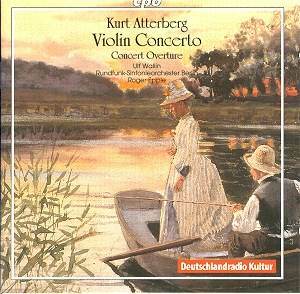 Atterberg did the Concert Overture no favours in its bloodlessly forgettable title. It is, however, another smiling piece which recalls, in Swedish colours, Dvoř�k�s Slavonic Dances and Scherzo Capriccioso. It ends in the sort of brassy triumph we know from the Atterberg�s Eighth Symphony - magnificent. Atterberg wrote concertos for piano (1936), cello (1917-27), french horn (1927) and violin. There is also a Double Concerto (violin and cello) from 1960. The present Violin Concerto is the first of the line and appeared between the second (1912) and third (1916) symphonies. It is the work of a convinced and convincing romantic with a beguilingly lyrical talent. While evidently requiring a virtuoso soloist it is no vapid display piece. Put it in a similar stylistic category to the Sibelius which it occasionally echoes. Also bear in mind its relationship with works such as the Bruch (the famous one! ), the Elgar and even - looking forward in time - the Korngold. The aristocratically satisfying melody sung by the soloist at 4:20 in the finale is memorable but this is a movement where the pages out-spin the invention; not by much but towards the close the threads begin to show through. All is redeemed by the hushed finale. CPO have released this CD on the heels of their world premiere recording of the Symphony for Strings. I hope they have the stamina to tackle the Three Interludes from the opera Fanal (magnificent), also the Double Concerto and we badly need an int�grale of the eight orchestral suites too. When that is done the operas remain compelling desiderata. How about Fanal (1934), Aladdin (1941) and Stormen (1947) for starters. Have any had opera house productions in recent years, I wonder? Alternative purchases? No other disc has the same coupling. At full price you can go for a seriously substantial pairing of the concertos for violin and for piano. It�s on the redoubtable Sterling label and is still excellent in every respect (see review). A V�rmland Rhapsody has been done before by Jun�ichi Hirokami with the Norrkoping orchestra on Bis. They include the Sixth Symphony in a very good modern performance to compare with Rasilainen�s on CPO. Yet more irresistible Atterberg. My recommendation is irrelevant if you have already caught the bug. If the music is still unfamiliar to you let me commend it. You will need this disc.